Chief Neptune of the Passamaquoddy tribe next to the “Skutik”. In the far Eastern reaches of rural Maine, a river winds it way northward from its mouth near the Passamaquoddy and Cobscook Bay. 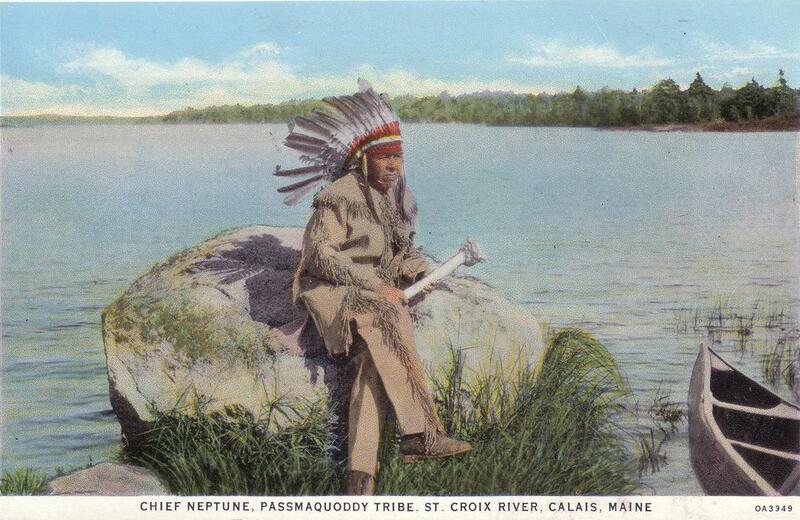 For thousands of years, the river was called “Skutik” by the Passamaquoddy people that lived there; prior to that it was inhabited by robust cultures of their ancestors. In 1604 a small island within the river provided the site for the first European settlement North of Florida that lasted for a full winter. It was a particularly harsh winter, and at least half of the Frenchmen that spent it on the island perished. Many more would have died without the help of Passamaquoddy, who in the springtime were able to bring over fresh venison that resolved the scurvy that plagued them. 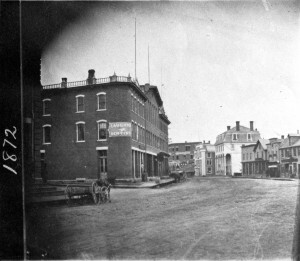 Since that first settlement, the St. Croix River Valley has seen the establishment of numerous towns and ports along her banks, in both the United States and Canada. The City of Calais is one such town, and in the early years it rapidly flourished from the wealth of the lumber industry. Despite being in such a remote location, settlers flocked in on boats and on horses, planting their roots into soil strewn with massive boulders from the passage of the last glacier 10,000 years ago. 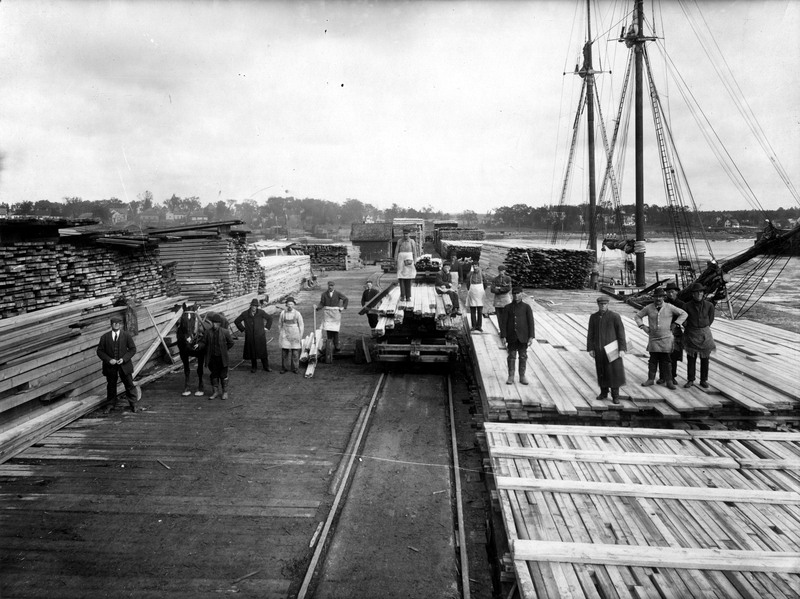 The docks of Calais were often brimming with lumber. The homesteaders worked to clear the fields while the lumbermen worked to clear the forests of their endless stretches of white pines that towered as high as 240′ into the air. 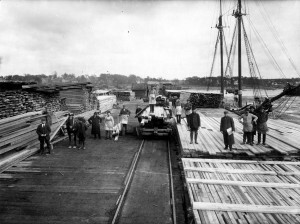 So much lumber was moved between the mills and the ports that the need arose for the first railroad in Maine in the early 1830s. Next to Bangor, Calais was the busiest lumber port in the state. Growth was rapid and expansion constant. By 1900 the population had swelled to 7,000, and the downtown featured an array of brick, granite and wood buildings of novel majesty. However, the collapse of the lumber industry took the prosperity of Calais with it, and the city has been struggling ever since. Though many buildings in Calais have come and gone, and others are slowly deteriorating, one thing remains constant: the people. Calais is home to generations of Mainers, a people notable for their solidarity and sense of community, even in the face of loss. The St. Croix Historical Society aims to record and preserve the history of Calais as well as our neighboring communities. This website is dedicated to sharing the knowledge, photos and artifacts amassed in our archives, which we collect and maintain thanks to the ongoing support and donations of community members. The Palladian Block (in brick) was built after the great fire of 1870. The fire started in the alley to the rear of this block. At the time, all of the buildings in this part of town were wooden, contributing to the scale of the disaster. The Palladian Block remains standing today.